For the first time in the history of the series, two races from the same country were on the world championship calendar, and what's more Italy hosted the final two rounds of the season at Pescara and Monza. Pescara was a familiar venue for non-Championship races running under the title Coppa Acerbo. Indeed, Enzo Ferrari had won the inaugural race there back in 1924. At 15.9 miles long, the road circuit on the Adriatic Coast was the longest ever used in the world championship and certainly provided a tough challenge. 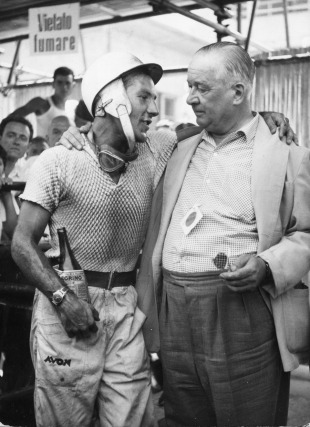 Because of the fierce summer heat, the race started at 9am in front of a crowd estimated at around 200,000 and by the end of the first lap Stirling Moss in his Vanwall had moved into the lead where he stayed for the remaining 17 laps, steadily increasing his lead over champion Juan Manuel Fangio. The top six contained four Maseratis and, in a foretaste of the following year, two Vanwalls with Stuart Lewis-Evans taking fifth place.